Free domain name transfers to Get Dotted! 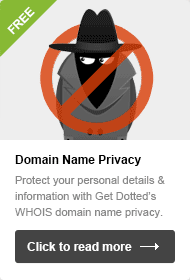 Why transfer your domains to Get Dotted? You can transfer your domain name to Get Dotted quickly and easily, and start enjoying our cheap renewals, fantastic hosting and great UK based support. To find out more about transferring just type your domain name into the box above. Transfer your domain to us for cheap domain renewals and extra renewal discounts. Get up to 20% off individual domain renewals. Receive a 10% discount when you opt-in to renewal reminders by text message, and a further 10% when you choose to auto-renew. A domain name transfer is pretty straight-forward, and we've worked hard to ensure that setting up your free domain hosting for email and a website is as easy as possible. To find out more about how to transfer, type your domain into the search box above for a transfer check, and we'll let you know what you need to do. 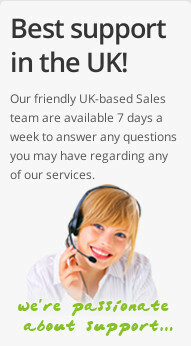 If you have any questions, contact our UK based Support Team. Get up to 20% off domain renewals with GetDotted! Receive a 10% discount when you opt-in to renewal reminders by text message, and a further 10% when you choose to auto-renew. It's that easy! Find out more about Domain Renewal Discounts. The authorities for certain domain types insist that domains must be renewed as part of the transfer process. Upon checking the eligibility to transfer your domains, we'll inform you as to whether you are required to renew your domain as part of the transfer process. Don't worry though, you won't have to wait until expiry is due, or lose any value for money if you renew early, the renewal will simply extend your registration period from the current expiry date. Please note that a smooth transfer to Freeola and Get Dotted is subject to the cooperation of your current host. Free hosting is subject to our Terms and Conditions which may vary. With a domain hosted by Freeola & Get Dotted, you will receive a free MyFreeola Account. This is the place where you can access all the settings and options you'll ever need for your domain. 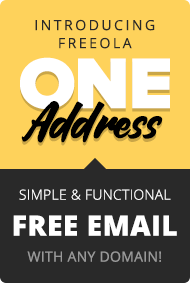 You can build a website, create email addresses, take advantage of our cheap renewals, free support and loads more all from your MyFreeola account. With a Freeola Internet Connection you can also take advantage of our Free Unlimited Services. Looking to move domain names away from us? A simple DNS change is the quickest and easiest way to use alternative hosting and you'll still be able to renew your domain name with us and benefit from our cheap renewals. Just ask your host for their DNS details, submit them through MyFreeola and the change should be complete within 24 hours. Click here to change your DNS. To move your domain away from Freeola & Get Dotted hosting and management completely, you need to request a full transfer. Please see our cheap domain transfer out details, or click here to transfer your domain now. enter it into the box below and click 'Check'.